Behind the Tracks: At-grade or Elevated? Where will the Cotton Belt go? DART first purchased the Cotton Belt corridor and right-of-way from the St. Louis Southwestern Railway in 1990. The corridor and surrounding area has dramatically changed since and will certainly continue evolving when passenger operations begin. While the initial concept for the Cotton Belt closely followed this specific railroad corridor, the current design concept has areas where the new track alignment would go above the current track profile to accommodate traffic patterns and new or growing developments around the corridor. The Cotton Belt will have the majority of its track “at-grade.” Meaning that the track will be located on ground level. When the Cotton Belt is traveling “at-grade” there will be points where it will intersect with traffic. Current points of crossings between roads and the Cotton Belt are below. Additionally, intersections near residential areas are expected to have Quiet Zones. These zones reduce the need for trains to blow their horns as they cross through intersections. So what does it mean if the Cotton Belt track is “aerial?” The route for the Cotton Belt may call for some portions of the track to be elevated or above-ground level to maintain acceptable traffic operations into the future. The corridor will maintain all grade separations from highways and freeways. When the Cotton Belt is aerial, DART will try to design the structures to reflect the surrounding environment. 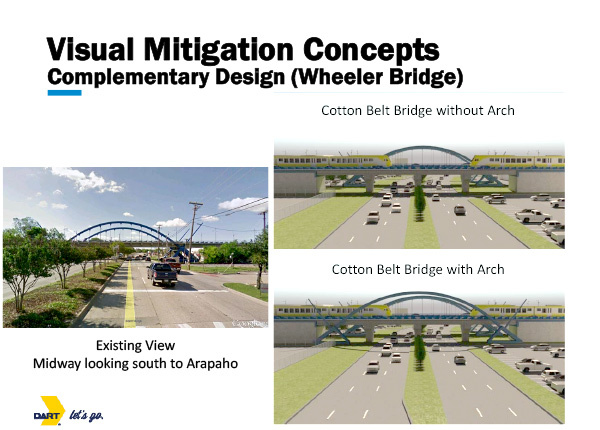 For example, DART has produced a complementary design illustrating how the Cotton Belt would cross Midway Road next to the Wheeler Bridge in Addison. Whether at-grade or aerial, the design of the Cotton Belt is developed with safety in mind. 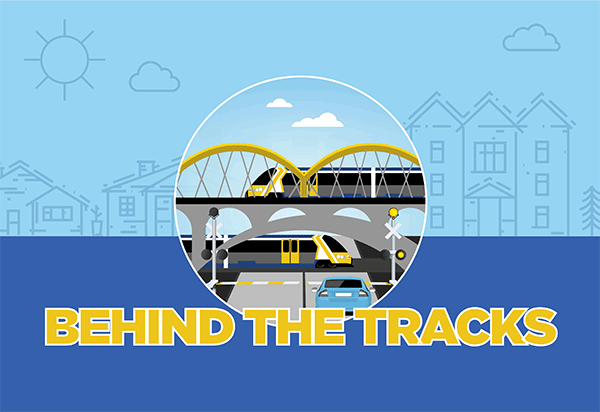 One of DART’s primary goals is ensuring that the eventual route of the Cotton Belt runs safely and smoothly with the flow of traffic, pedestrians, cyclists, and more. Our goal is that the Cotton Belt makes all forms of transit safer – not just for those who ride DART. Whether in the air or on the ground, DART will make sure that the Cotton Belt’s route is one that best balances everyone’s interests. 2 Responses to Behind the Tracks: At-grade or Elevated? Where will the Cotton Belt go?